A client in Orlando, Florida recently was building a new home and was in need of back yard home hardscape design and landscape design. The property had a small footprint that needed sophistication and interest to be created. This would provide an inviting back drop for family events and entertaining. The hardscape designer and their team started by carefully installing a retaining wall to create more usable space. 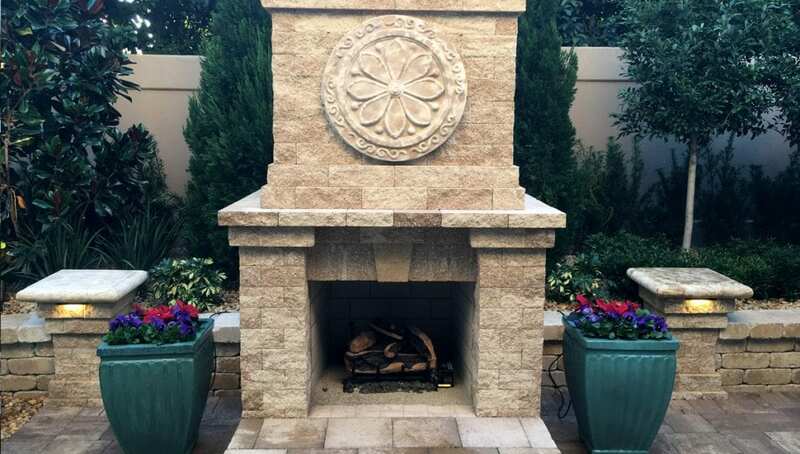 A decorative fireplace was then installed to provide a unique hardscape focal point for this Orlando, Florida home. Rustic pavers were installed on the lanai, walkways, and patio. Flagstone stepping stones and brown river rock were utilized for a natural walkway to an outdoor seating area. The team finished the hardscape design project installing an aluminum trellis with decorative pottery on an existing wall. This included colorful bougainvillea and standard roses. This home hardscape element outside the kitchen window brought a smile to the homeowner and visual interest for her guests. A landscape design was then created and installed that provided an instant sense of being in a garden. This included large trees & palms to provide privacy and balance with the large fireplace. Groundcover and perennials were added for softness. Finally, the hardscape design team installed LED landscape lighting for all trees & focal points. This created visual interest from inside the house at night. With a unique home hardscape design implemented on this Orlando Florida home, the family has created an outside room that look like it has always been there. If you have an Orlando, Florida home in need of a landscape & hardscape designer call BLG today!